Santa ditched his reindeer for a sweeter "sled" this Christmas—giving a personal shout-out to a fellow rider! 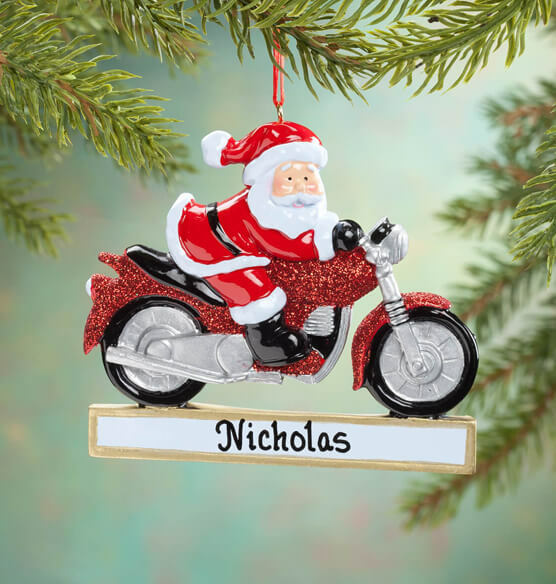 Featuring Santa cruisin' on a glittering red bike, this personalized Cruisin' Santa ornament makes a perfect gift for any motorcycle enthusiast. We'll personalize, revving up the fun! Specify name; limit 1 line, 20 letters/spaces. Resin. Christmas ornament measures 2 1/2" long x 4" wide. I bought this ornament for my little grandson, who loves motorcycles. I know he will have fun with it, and love putting it on the Christmas tree. Bought a bunch of these, and the Santa and Mrs Claus ones too for our friends. Love them. Purchased 3 for surprise Christmas gifts. Heavier than the ones I ordered last year. Looked JUST like the picture. Very happy with my purchase.